The Delta Stewardship Council (DSC) is a unique placement since it is the only host agency in the California Sea Grant State Fellowship program that focuses on a freshwater system. As a marine scientist, I had to learn about freshwater systems, as well as the complex issues that come with trying to balance water supply reliability with ecosystem health and human/cultural values. The future of the endangered Delta smelt at UC Davis Fish Conservation and Culture Lab, where we watched professionals tag and culture Delta smelt to create a refuge population. (left) Fellow Stephen Pang, Delta Stewardship Council’s Scott Navarro, fellow Amanda Wasserman and fellow Cat Pien at the C.W. Jones Pumping Plant; (center) A female [above] and male [below] Delta Smelt at the UC Davis Fish Conservation and Culture Lab; (right) Cat Pien, Amanda Wasserman, and Stephen Pang share smiles at Rush Ranch. Besides the Bay-Delta Tour, some of the fellows have also gone out in the field with monitoring and research programs in the Delta. One of my most exciting trips in the field was with the Suisun Marsh Fish Sampling Team (led by Teejay O’Rear at UC Davis), where I got to see an abundance of native fishes and hear about all the fish Teejay had ever caught (a long list). 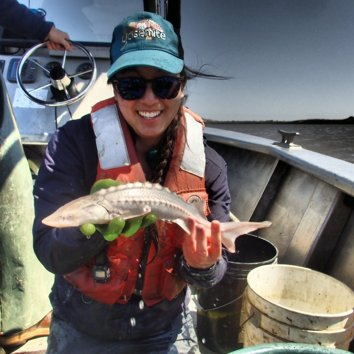 I had jokingly requested that we catch a sturgeon that day; my dream unexpectedly came true when we caught a small white sturgeon, which to me is the Delta equivalent of the sharks I used to study for my thesis! (left) Field site in Suisun Marsh; (center) Cat shows off the small white sturgeon caught during a sampling trip; (right) Dan Ellis from the Fish Restoration Program shows off aquatic vegetation sampling equipment. Some of the fun Delta/Sacramento activities I enjoyed with other fellows included cooling off in the summer by floating down the American River, exploring charming swimming holes on the Yuba River, and going on an evening bat tour to watch Mexican free-tailed bats migrate out of the Yolo Bypass (which inspired my Yolo bat Halloween costume). Around Halloween, we also (almost) made it through a spooky escape room, and (actually) made it through one of the largest corn mazes in the world! If you move to Sacramento, I highly suggest getting out into the Delta, even if you’re in a marine position! If you’re especially adventurous and burning man is too cliché for you, live out our DSC fellows’ dream and take part in Ephemerisle.